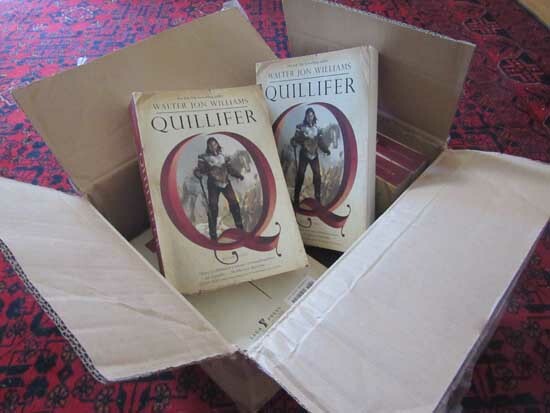 What should arrive in the mail but a box of Quillifer! These aren’t the hardbacks that have been out since October, but brand-new trade paperbacks! For those of you who didn’t want to shell out for the hardback, and prefer fine crisp paper to ebooks, this is clearly for you! I read the eBook. A very enjoyable read, thanks! Any chance you will be selling any copies to be signed at Bubonicon? I will take a hardback if you happen to have one. Ralf, I’m sure dealers will have copies. It’s like carrying coal to Newcastle to post this on the author’s web site, but if you’ve not read “Quillifer”, you should do so at your first opportunity. It’s a good read. Thanks for your work, Mr. Williams.